Forced to flee The Academy after killing another student, Azerick sets sail to start a new life and a new home from where he can continue to grow in power so that he may avenge his father's murder. However, the fates have not finished with the young sorcerer. A massive storm blows his ship into the clutches of a terrifying creature with the power to control the minds of others and enslave them to its will. Azerick becomes the pawn of this creature, but what happens when an irresistible force meets an indomitable will? After leaving the Academy, Azerick has no choice but to go on the run. He seeks a ship to take him away, but things don't go smoothly at sea and Azerick and the crew are kidnapped and taken to a strange island. There they are forced to either be slaves or fight in an arena. Azerick can fight, but his opponents are getting tougher as it progresses. He doesn't want to kill people, but how can he escape something that can control every aspect of his mind? Having enjoyed book 1, I was eager to see what was in store for Azerick, well the author didn't disappoint with this edition! It was a lot darker and more action packed than the first. I flew through this one!! The plot was pretty much non stop. Azerick finds a captain that knew his father and allows him to come aboard his ship, but he must pay his way by working. So he helps by using his magic when he can. But the crew are attacked by Minotaurs and taken prisoners. From that moment, the action is non stop. Character wise, Azerick has really grown up during this book. His character development was awesome!! He goes through a lot of and it seems that each event leads to him becoming more of what I hoped he would be. I loved that this one was focused on Azerick more than the first. We get to connect with him more and become invested in his story. There are plenty of other characters but Azerick is still my favourite. In all, a great second book. I loved everything about it and am really looking forward to the next one! As with the first, William Turbett read this well. He is clear and easy to listen to and his tones and cadences were good, but I still found his voices for certain characters too similar to truly identify who was talking at any given time. I LOVED this book! I feel like so many things happened that I just really never saw coming. Yes, of course, some things were predictable at times, but I found the story very well done and strong on its own merits vs fantasy trope. The book starts out with Azerick not too far out from the events of book 1; a pretty good spot to start for minimal confusion. We do come to learn some of the highlights of book 1 through context of natural discussions, so there is some built-in refresher. It is kept to a minimum and was well done, and useful. That said, this book was all its own. It goes to different places and carries many different themes. We start getting a taste of the true sorcerer that Azerick is and is becoming. We learn that there is more to magic, too, and I found the presentation of those magics and of the characters involved to be delightful. I had fun listening through the entire book after I got going. There was just so much content! William Turbett improves VERY nicely from book 1. I think he's found the character's voice, and he relays all of the characters very well. I couldn't decide on 4 or 5 stars from Turbett's narration easily; it was close! I opted for 4, though, because it took just a bit more of the story than I wanted before his narration had me invested. Also, I would still love a bit more vocal differentiation at times. My true rating for him is more like 4.4 /5... so close :) He really carries the bulk of the story so well. I would love to listen to more of Turbett's work as he continues to improve his narration. I believe he's going to be reliable for a good listen. I've already begun looking to collect more book by Brock Deskins, which is among the highest praise I can offer. Deskins is telling a wonderful story, and not just in this series alone! I really enjoyed his other series, starting with Shroud of Darkness, too. I am eager for more audiobooks from these novels! I am grateful to have had this opportunity. Very good continuation to the story. 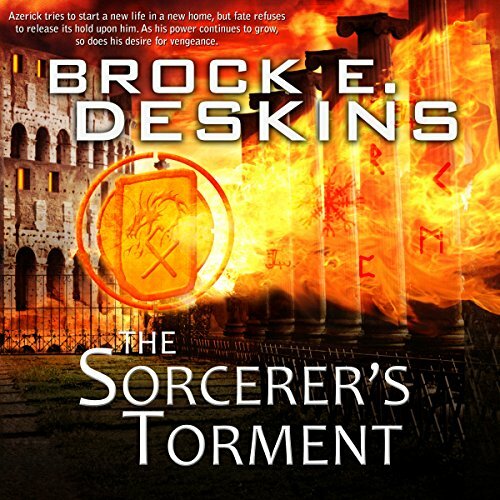 I want to thank Brock Deskins for providing me with a review copy of this audiobook. I really enjoyed this book, but I have struggled with writing this review, because the book felt so different to me, but I couldn't put my finger on why it felt that way. I think that I finally figured it out. This book is very much like a collection of novellas, all focusing on the same main character. Our hero gets into a bad situation, there is a conflict, then resolution and a denouement, that then leads right into the next bad situation. The main character moves on and leaves all the side characters behind as the next story is told. There are also glimpses of a large over arching conflict that is rising, and I can only assume will come to a conclusion in the last book. Basically this is a collection of stories of how to hero grew strong enough to eventually beat (I am assuming in the future books that he will ultimately be victorious) the big bad guy at the end. This anthology-like structure is not bad, it is just different from most other books that I have read. I really liked it and I am looking forward to the next book in the series. This story's main character shares much in common with other downtrodden modern contemporary magic users. Though his name is not Harry, like 'Harry Potter' or 'Harry Dresden' the unfortunate events in his life and his witting or unwitting resolution of them propels him into a legendary status that he neither wants, nor feels he deserves. Also like the previously mentioned contemporaries, the things he actualy does desire have either been taken from him, or experience and personal self-loathing tell him are not feasible for him to have. Although the narrator does an adequate job, there are certain negatives that hurt the storytelling. He has a good range of tones and voice differentiation, but his pause choices along with the 'I have a stuffed up nose' quality of his voice frequently break the immersion of the story, often at critical or dramatic moments. From what I have listened to in this book, the main character has that root for the underdog feel to him that makes me hope that I can get access to more installments of this story. I want to see what he is able to build from the ashes, some of his own making, of the destruction around him. The author also leaves open several possibilities for unexplored connections to be further built upon and my curiosity is itching to see where those will lead. As the second book in the series, I thought this one held up quite well to the first. In fact, I thought the author has started to truly find his path better in this book. By that, I mean, the story felt smoother, and less inconsistent. I thought the narrator did a decent job as well. All in all, an entertaining experience. I will definitely look for the next in the series. A good narrator can transform a mediocre script into a an entertaining listening experience. A bad one can draw attention to every mistake an author makes, and make a novel difficult to finish. Unfortunately, that's the case with this book. Neither the text, nor the production seem ready for retail consumption. The narrator stops at odd places, speaks way too fast as if just trying to get this job over and done with, and is terrible at acting. There were pauses at strange places, and the dialogue seemed unnatural. Near the beginning of the text, it didn't sound like it was recorded in a sound proof room on a couple of occasions. One or two times a word/sentence was cut off half way, and then restarted, and a bunch of words were mispronounced. I feels like someone just reading a book out loud, rather than acting as a performance artist which is what the skillful narrators are. With a better narrator with some acting skills, this might have been fun to listen to. Instead there were times where I thought, "Please... just make it stop." This book has the bones of a good story, but needed a lot more revisions before it was ready for retail consumption. There are many redundant descriptions that grate on the nerves after a while, and the dialogue often seems robotic. Again, with a few more editing passes used to freshen up the language, eliminate cliche (or unnecessary) descriptions, say no to exposition, and stamp out insta-love (seriously... it's like "here's another slave" then two seconds later they are professing their undying love to each other) and provide characters with emotional depth that readers can relate to, it could have been wonderful, but as it is... everything all feels sloppy and rushed. I wouldn't have noticed as much of this as I did, with a better narrator. I think I'm done listening to this particular series. Listening feels too much like work and not enough like entertainment. Don't let this series put you off all of Deskin's work. Shrouds of Darkness is an entertaining listen that I highly recommend. It's hard to believe that the same person wrote both novels, and I have to wonder at the lack of care given to perfecting the Sorcerer books compared to Shrouds. If they decide to keep turning this series into audiobooks, I hope for the sake of listeners that a new narrator is chosen, and the script is revisited with fresh eyes before production. I want to start out by saying that I missed out on the first book, which is my loss, because this was a fun introduction to Azerick. Although I do have to say That I am glad that I'm not him. He goes through a lot in this book, and if it was me, I might rethink my whole desire to do some wizarding. Gardening might be more my style. It wouldn't be nearly as interesting a life as what Azerick has, though. Of course a gardener is not going to get nabbed by slavers and made to fight in an arena. Pruning shears, no matter how formidable, just can't compete in that theater. Azerick sure as heck can, and does, though. He starts stomping everyone he has to since it seems his lady pal and their wee unborn baby are being held hostage. So what is a wizard to do? What do you think. He's not a gardener. He starts sling spells, and goes off to save the day. The book is incredibly well paced, is chock full of action, magic, monsters, and evil rotten guys that need their faces rearranged with someone's boot. This book is an absolute adventure. One that you will never regret partaking in for a moment. All I can tell you is that once the action starts you'd better hold on with both hands or you will get sent into orbit without a suit. The narration is pitch perfect, Turbett knows how to pace a story, and he conveys the action and emotions as if he were reliving it as he tells you the tale. He inflection, voices, and command of the story itself elevates this beyond a simple spell caster story. You will walk a way saying that he is Azerick! Even though I did receive a promo code for this review it in no way influenced my considerations of the material, and in fact, inspired me to be more honest. In fact, getting a code generally makes me harsher as a reviewer as I am more often concerned what someone like Me will decide based on my review. From the beginning, I was hooked on this series! Azerick is a protagonist that kept me listening and wanting to hear more of his adventures! I loved the audiobook and can't wait to read the next one! I thought the story was good. The narration was ok at best. Very well spoken and understood, but his story telling needs work. There were numerous redundancies I don’t if it’s in the wringing or the narration, but it was quite annoying.